K-442 Chelyabinsk is a Project 949A Antei nuclear-powered attack submarine (SSN). The submarine was laid down on May 21, 1987 at Sevmash shipyard (Severodvinsk) under the name of K-442; launched on June 18 (or 15), 1990; commissioned into Northern Fleet on March 14, 1991; transferred to Pacific Fleet on September 24, 1991; obtained the name of Chelyabinsk on April 13, 1993 being taken under patronage of Chelyabinsk city administration. In 1993, 1994, 1995, 1996, 1997 the sub's crew took premier place in Pacific Fleet 2nd Submarine Flotilla among similar class subs. In 1994 the sub excellently trailed American carrier strike groups Kitty Hawk and Independence. In 1998 the sub's crew took premier place in Pacific Fleet 16th Submarine Squadron among similar class subs. In May 1999 the sub was laid up for repairs. 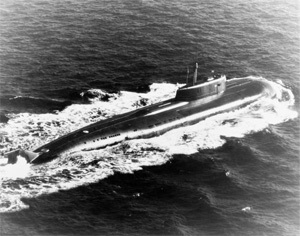 According to some information, in 2002 the sub underwent interim overhaul in Viliuchinsk. As of March 2009, the sub was still in reserve.